Transenses and their universe, our universe? After this moment, as absurd as it was pleasant, and after the performer (Lucy M. May) emerged from the corridor to cross the coffee bar in the Wilder Building, we entered the grand hall to "embark on a metaphysical journey of a body in conversation with the universe" (program) with Akiko Kitamura and Navid Navab in their TranSenses. A solo dancer begins by undulating her chest in reaction to the electroacoustic music and then transforms by giving life to her shadow, moving this time in interaction with the projections on the ground. There is a perfect fusion of the body, music and projected visuals, traveling from an aquatic universe full of poetry to that of an anguishing black hole, going through a fierce fight between a tamer and his lion, or a fight with oneself. A three-dimensional reality then takes shape while continuously metamorphosing into a perfect continuity, despite some technical concerns—a reality that finally turns out to be the reality we experience every day by reacting to slightest sounds and slightest visual solicitations. We all went into the hall where the duo Akiko Kitamura and Navid Nabab presented TranSenses. I almost did not enter because I had lost my ticket while moving. Imagine a large stage with a solo dancer in the center, electroacoustic music that reacts in real time to the movements, and an interactive video projection across the floor. The three mediums were merged from the beginning to the end. It was very convincing, especially the sound design, to talk about what I know. It was always proportional to the acceleration of the body in a kind of sound/movement feedback. We were treated to wind, water, repeating bass, and whispers in perpetual evanescence. Sometimes the artist danced on a carpet of shooting stars, another time the artist was absorbed by a black hole before ending up in a surreal aquatic world. At another time, straight lines were projected onto the dancer to make the topography of her body. “It looks like a study of impacted movements versus impulsive movements. " “Sur mes pas en danse: des "Re´sonances virtuelles" toutes aussi re´elles que de´routantes” writer by Robert St.
After a successful start to the evening, we are invited to take a seat in the hall to attend "TranSenses" by Navid Navab and Akiko Kitamura, with the latter as the dancer. Captivated, would be the appropriate adjective to describe me throughout the presentation which, according to the leaflet, "Transcends an aesthetic and try to make palpable the imperceptible." From this body that communicated with its virtual environment to produce very successful visual and sound projections, I remained completely captive. The gestures were beautiful and amplified by the sensors that reverberated on the stage. I must confess that with this dancer, I would have accepted to go to the confines of the universe. And she left us without returning to be applauded, like a virtual being. "Magic!" In the past twenty years of the Japanese contemporary dance scene, collaborations with overseas artists have become quite common, but has it ever shown the depth and aptitude as this To Belong? The songs from Indonesia and traditional expression using the body merge with its contemporary Japanese counterparts in an effortless manner, creating an atmosphere defined as “Asian.” Yet it does not play upon the stereotypical “oriental” image, but rather diversify this imagery that is defined as oriental. This piece achieves to reach the supreme goal of what contemporary dance has been aiming for. 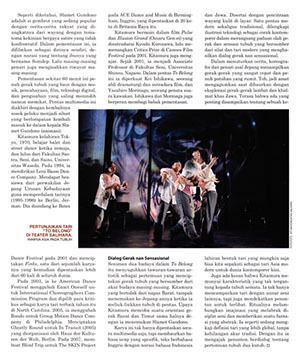 In 2011, the renowned Japanese choreographer who already established an international reputation, Akiko Kitamura, came to Indonesia for a creative exploration. She was looking for what she describes as “the Asian body in contemporary dance.” She visited Solo and Yogyakarta, and met with unique artists who based their work on the traditional art form also to transcend to others, which enabled her to bring art on cross-disciplinary interaction. In Solo, she was fascinated by Ki Slamet Gundono who was experimenting with his own puppets. She was also fascinated by Endah Laras, a versatile singer with a very strong foundation on tradition. In Yogyakarta, she 'fell in love' with Mohamad Marzuki and Kill the DJ who successfully merged hip-hop with tradition and philosophy of Java . The meetings inspired her to initiate a collaborative work that combines all the elements that interested her. She also invited Yudi Ahmad Tajudin, the artistic director of Theatre Garage in order to bridge the two cultures. The result is a dance-theater entitled To Belong / Suwung. This work was first staged in Nagano, Japan in November 2013. Then in March 2014 it was presented again in Singapore, and finally returned to Japan to the international dance festival “Dance New Wave” in Tokyo in October 2014. Towards the end of this year, the art enthusiasts in Indonesia finally had the opportunity to witness this special show. This was an occasion that could not be passed because originally there were no plans to stage To Belong / Suwung in Indonesia. Luckily Akiko Kitamura was in Jakarta for the staging of the opera-theater-dance Gandhari (Theatre Jakarta, December 12 & 13) which was also directed by Yudi Ahmad Tajudin and involved the dancers in To Belong / Suwung. There are 3 Indonesian dancers (Danang Pamungkas, Rianto and Lulu Ari Prasetyo) and 3 Japanese dancers (Kana Ote, Yuki Nishiyama and Llon Kawai.) So all the important figures to stage To Belong / Suwung for the public of Jakarta came together. To Belong / Suwung is a rich display of the arts. The curtains maximised the minimal stage serving also as multimedia screens. The main screen opens with the video of Slamet Gundono singing with his trademark style: an ukulele and the Banyumasan dialect. Then with the same small guitar carried around her neck, Endah Laras appears. Her song accompanies the dancers who appear one by one on stage. In the beginning the three Japanese dancers and the three dancers from Solo and Jogja move in contrast as to emphasise their differences. They are trying to communicate and seek a common understanding. Keeping their distance with each other, but at moments coming to contact and surprising the other, until gradually the six bodies become united in various complementary motions. Japanese martial arts action captured by Indonesian martial arts, combined with the traditional dance of two cultures, creates a sort of conversation without words that is dynamic and full of energy. Music produced by Yasuhiro Morinaga combine diverse field recordings, including recording of Slamet Gundono’s voice and hip-hop songs by Javanese Mohamad Marzuki. There was a moment when Slamet's voice fills the empty spaces between the dancing bodies: the puppeteer tells the struggle of the gigantic stature with a drop of dew on the tip of the leaf that he could never drink, and his frustration and feeling small and helpless in the face of this drop of dew. Then the sound of Slamet’s chant connects to Marzuki’s lyrics that describes the body connected to the soul “that has not lost its holiness.” The transition from Slamet to Marzuki is so smooth, and all the elements come together, gestures, songs, visual graphics and animations. In such a union, without the specific role and relation to one another, it felt that Slamet Gundono was an important foundation and an irreplaceable figure. Unfortunately during the process of creation, Slamet died in early 2013. The work is unique and this wonderful collaboration is owed ? ?to him, so that the performance in Indonesia particularly had an important meaning. And the good news apart from the two days of presentation in Jakarta, To Belong / Suwung will "return" to Solo, the place of its origin where this collaboration began. In Jakarta the show was held at the Goethe Institute and still can be seen for free on Wednesday (Dec 17) at 20:00 pm tonight. In Solo, To Belong / Suwung will be presented at the Theatre of the ISI this Saturday evening, December 20. This is the last work that Gundono Slamet was involved in the world of international performing arts. In this work, the last song he created before his death plays an important part and has never been played before in Indonesia. Therefore it is appropriate that when staging To Belong / late artist for all his contributions to the arts in Indonesia and all over the world. Perfect Chaos Leni-Basso was already a hot group of the world when they presented its gorgeous piece called “Finks”. “Ghostly Round” , the new piece recently premiered was a co-production with HKW. It boldly shows a clear distinction from Butoh movement, however it could never have been achieved without it. The audience may just yield him/herself to a whirl of the intricate movement. Though, not all of the audience was ready to do this. The relationship between coexistence and conflict, apathy and approach, enforcement and freedom which the performers like ghosts play out on stage can be related with to the entire world. If you see the piece this way, you can say that Leni-Basso is ideally introducing the theme of this festival. It is not easy but it’s no wonder. The world is never easy. In Tangled Ritual “Ghostly Round” is like daydream or meditation. In previous works, Akiko Kitamura prepared almost excessive number of equipments and played in a virtual world. The body was asserting its presence against the world, but was taken into the world and disappeared. Because of these previous pieces, Kitamura was described as a follower of the legendary performance group, dumb type when she presented her piece in Berlin for the first time. In “Ghostly Round”, surprising technique is entirely eliminate. Instead, the piece became quiet and profound and shows essence of dance. This piece is based on imagination of how dance can foil social discipline, code or ceremony and make it powerless. 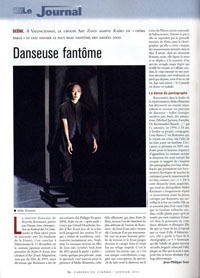 Kitamura’s dance fantasy is generally presented in an abstract tone. In this tense relationship between discipline and chaos, they play with invisible elements of dance. “Dance is something like parasite” like Kitamura says. Machine Dance in a Trance It was a dance in a big city. Leni-Basso, a dance company from Tokyo presenting its piece “Ghostly Round” seemed to be infected with an almost uncontrollable dance virus. Dancers in white costume appears on a half-round stage. They put their hands on their lower abdomen as if they were trying to be conscious of the source of power. Then suddenly the dancers are seized with an impulse to dance. They sometimes transform into impatient robots. “Ghostly Round” goes back and forth between suppression and expression. Akiko Kitamura, the choreographer announces the contradictions in Japanese society through body. It gave us an impression of looking into inside of a machine. A perfect balance between dancers, images and sounds Like they did in Julidans 2001, the group from Tokyo, Leni-Basso, surprises us with a performance in which dance and multimedia keep each other in perfect balance, embodying a central idea with great consistency. Integrated Multimedia Performance “Finks” is an exciting experience performed by virtuous dancers leaving a sense of light numbness in body and mind. We might have an idea of Japan as a high technology multimedia society and Leni-Basso is really showing us this during their performance with light, sound, movement in a complex and kinetic performance, video cameras, new, old images projecting our present time, Anime, martial arts, soft fighting scenes. The dancers achieve to make the impossible. They got rhythm, they got music. Who could ask for anything more? Audience reactions ranged from admiration to fascination. A True Masterpiece is Born! “It is amazing that Leni-Basso’s ‘Finks’ maintains the high tension until the very end. Involving audience in the fictional world with a story and suspend their tension is not difficult. Akiko Kitamura, however, does not do such a tasteless thing. She chooses a modern technique: rejection of audience’s assimilation to the stage or emotional involvement. It is extremely difficult to maintain their keen interest and breathtaking tension in this way. Ms Kitamura has developed her own style to explore the possibility. ‘Finks’ is the completed form of this effort. While ordinary dance is choreographed with beautiful poses and flowing movements, elements of Ms Kitamuraﾕs dance are preparedness to move and terminated movements. The preparedness brings out tension with expectation of move, and termination creates tension by blocked expectation. Of course, if unskilled dancers do this trick, it is simply boring. Fascinating Polyphony of Various Sounds Resonance “It was refreshing to see immovability in a dance performance, which, in general, celebrates physical flexibility of trained dancers. What was more, when dancers of outstanding capabilities danced such movements, the deformed forms due to lack of free movements shone out beautifully. Especially when the powerful male dancer expressed the deformation, the tension rose.